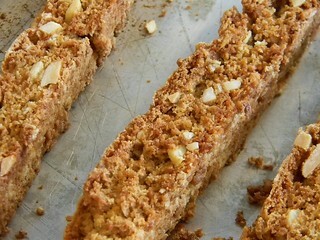 Vanilla Almond Biscotti | What Smells So Good? Preheat the oven to 350 F and line a baking sheet with parchment or silpat. Whisk together the flour, oats, sugar, baking powder, baking soda and almonds. Pour in the almond milk, then add the vanilla seeds, oil and vanilla extract. Stir well - dough should be very stiff but cohesive. Shape into a flattened log and place on the sheet. With a sharp, serrated knife (I used my mom's awesome CUTCO bread knife), slice the log on a bias, arranging the pieces (cut side down) back on the baking sheet. Bake for 10 minutes, then flip carefully and bake for another 10 minutes. Cool completely - they will crisp as they cool. 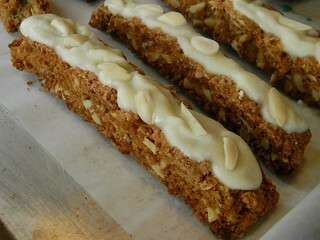 These are delicious dipped in white chocolate with slivered, flaked or ground almonds on top.